What Does Living Wisdom School Offer that Other Schools Don't? 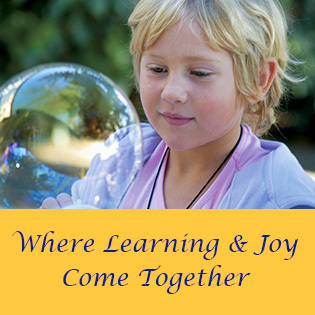 Q: What does Living Wisdom School offer children that other schools do not? A: Most parents who inquire about the school are worried about two things. They want a personalized education for their children, but they also want rigorous academics. Often, they feel that if you have one, you can’t have the other. At Living Wisdom School, we’ve shown that you can provide both, with excellence. Q: Do the children receive individualized attention? A: Our small size allows the children to move through their education fluidly, with attention to their individual needs. Our student-teacher ratio is approximately one to eight. If a child is ahead of grade level, that’s not a problem here, and if a child is behind, that’s also accommodated. I have a boy in my eighth-grade class who’s doing high school senior level math. He has the ability to become a world-class mathematician, and we’re helping him learn at a pace that’s appropriate to his abilities. We’re small enough that if a child has any kind of an issue, the entire faculty knows about it and can help the child. Nothing is compartmentalized, and nobody falls through the cracks. We also have a fabulous parent community. The parents are highly interested in their children’s well-being, and it isn’t unusual for a parent to share his or her special expertise in the classroom. One mother who’s a scientist taught science here for two years. It was a marvelous experience for the children, and for her. Another parent taught a unit on marketing and computers, in which he showed the children how to create a PowerPoint presentation, complete with text, charts, and slides. Q: You emphasize “spiritual” education. Are you a parochial school? A: We are not a parochial school, even though the main school building is located next to church grounds, and two of our classrooms are in the church office building. 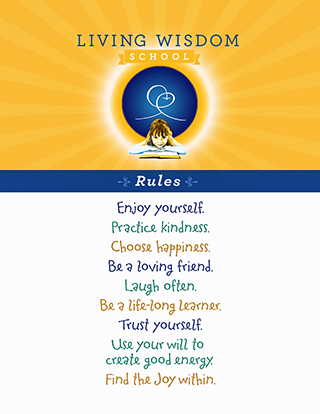 Our belief is that each religion, in its essence, encompasses the universal truths embodied by our school rules. Thus, for example, Rule Number One is: “Enjoy yourself!” As we interpret it for the children, it means that if you really want to enjoy yourself, you must be concerned for the happiness of others, and for the single, deeper Self of which all religions speak. When we speak of “spirituality,” we aren’t talking about blind belief or intellectual abstractions. We’re talking about some very down-to-earth, practical principles. For example, spirituality is what happens in math and science classes where we teach the children about the unity of all living things. In fact, that’s an excellent illustration of a spiritual principle that has profound implications for learning. Brain researchers have discovered that when children are given opportunities to make associations between their separate school subjects, they become better learners, because associative thinking creates new dendritic connections in the brain. Thus, if a child can understand a math concept simply by looking at the printed page, that’s certainly all well and good. But if you can connect the math concept in the child’s mind with science, poetry, and music (which we do all the time), the child becomes a better learner. We are extremely sensitive to the need to create these connections, and it’s one of the reasons why there’s a great deal of thematic integration in our curriculum. Q: Are your teachers well prepared in math and science? A: Over the years, we have developed a math program with depth and breadth that excites even those children who may not be especially gifted in math. At our year-end ceremonies, the younger kids get to stand up and tell what they like about the school. And over and over, they say “I love math!” Our math and science teachers communicate the love that talented mathematicians and scientists feels for their subject. Their classes combine lecture, lab, and projects. Q: You emphasize the performing arts. Why is that? A: We place a tremendous emphasis on the arts, though by no means to the detriment of science and math. Many of our parents are Silicon Valley scientists, engineers, and computer professionals, and they tend to be a skeptical initially when we talk about the arts program. But we’re very balanced. And, in fact, some of our best student-scientists and mathematicians are also our best violinists, artists, singers, and dancers. We want to educate the head and the heart. We’re very clear about this, and the performing arts program is a glowing example. Each year, we challenge the students to participate in a play that has the sophistication of a very advanced high school production. We then support them in stretching their minds, hearts, and wills to rise to the challenge of performing. The play is an enormous stage for exercising and developing skills that help them tremendously in their academic development and progress: they learn to be completely focused on the subject at hand, they learn to “think on their feet” and to express themselves clearly, and they develop a passionate fire for learning. The play is an excellent expression of our interdisciplinary curriculum, as well as how we educate the children’s hearts and minds. One year our theater production was Jesus of Nazareth. As the children prepared, they became little biblical scholars. At the same time, they were studying Greek and Roman history and mythology, in order to better understand the historical background of the play. When we produced a play about Kuan Yin, the Chinese goddess of compassion, we studied Chinese literature, history, and philosophy, and the children learned about Chinese art, music, and dance. Year after year, as the children produce these plays, they internalize the great stories of the world. Thus, they receive priceless keys for deciphering great literature. But they’re not only studying related academic subjects; they’re learning to be poised and graceful, to concentrate, cooperate, and receive direction and feedback. Q: Do they enter into the experience willingly, or do you have to push them? A: They are so excited! And it’s their enthusiasm that motivates them to master the challenges. For example, the vocabulary of the play is always far beyond the third-grade level. So the third-grade teacher simply makes it part of the children’s vocabulary lessons. 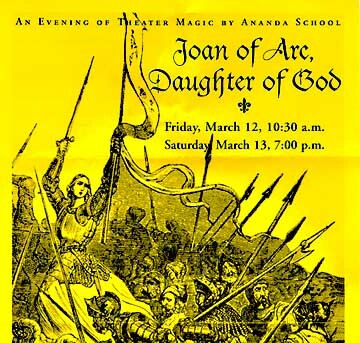 Poster for the annual school play several years ago. They learn to use the dictionary, and they master the big words until they’re able to listen to the play and understand the meaning of the lines. The children also pick up vast stretches of each other’s parts, so it isn’t as if they’re learning only their own parts in isolation. They become verbally very sophisticated, because as they say the words with understanding, and those words become a permanent and meaningful part of their verbal repertoire. Q: You seem to be saying that the arts stimulate learning of all kinds. A: Exactly. And the children not only learn a great deal about intellectual subjects, as well as social and character development; but they’re receiving non-denominational spiritual instruction by acting out the lives of great teachers in all spiritual paths and traditions. By performing these great epic stories, they learn about the play of light against darkness. In the context of the life of a great soul, whether it’s Buddha, Jesus, Krishna, Moses, St. Francis, or Joan of Arc, they are offered the possibility that they can confront evil and win. Year after year, they’re acquiring a repertoire of heroes against whom they can measure their own efforts to lead a good life. And they know what it means to love God and “love your neighbor” through participating in the lives of these great examples. Q: Do those lessons rub off in the classroom? A: Yes, emphatically, they do. And they also rub off on the playground. On the playground, you find out how well you’re doing, or not doing as a person. These are just normal children, and they do get into conflicts. We don’t pretend that they won’t. But when they do, we have a conflict resolution program in place from kindergarten through eighth grade. And the lessons they learn from putting on these plays transfer to the playground as models for how good behavior yields the highest happiness. The father of a little girl in our school reported that his child has become the neighborhood referee, so that when the other children have a conflict, she faces them off and says, “Okay, you stand here, and you stand here. Look in each others’ eyes. You listen; you talk. Then you listen, and you talk.” And she encourages the children to come to their own resolution. With the younger ones, the teachers need to provide the language. But with the older ones, the teachers can simply monitor the students’ energy, because the children are familiar with the process. “I didn’t like it when you did this to me.” And the other child knows he must acknowledge what the first child has said. Thus, through respectful dialogue, children can learn to reach harmony. In many schools, these issues of conflict and feeling are seldom addressed. And they are critically important for creating a harmonious, safe learning environment in which the students feel supported. Q: How do the teachers earn the students’ respect? A: Certainly by being real with them. We do not look away from anything. We face things head on, and we draw the parents in as needed. One child began suffering from separation anxiety from her mother. She would get all the way to the door of the school, but she couldn’t come in. I was in contact with the mother, and we worked to help the child. Meanwhile, I shared with the other children that this little girl was having trouble coming to school. I said, “First of all, we’ll pray for her.” So we did healing prayers–which the children love. They pray for everything – pet rats, hamsters, parents, siblings, all in the same breath. A few days later, they were out on their morning run, and they came around the corner just as she was getting back in the car. They went over and literally “loved her” out of the car – they tugged at her and said, “We want you to come!” And she came back into the classroom. Shortly thereafter, she had to decide whether she would go on a major field trip across the country. We bought her a ticket, and the day of the trip she came to the airport, but she was holding onto her mother’s hand with an iron grip. I thought, “I don’t know if she’ll be able to do it.” But at the last minute she got on the plane, and she sailed happily through the trip. If you bring children into the reality of what’s going on, you have no trouble. But if you rely on unnatural authority, they know it’s fake, and they don’t respect it. That’s true in any school, but we have a student-teacher ratio that allows for a kind of personal attention that enables the children to develop a respect for the teacher, the school environment, and each other..
Q: Many people believe that time spent addressing feelings is just time that’s lost for learning. Q: Does the children’s enthusiasm for academic subjects affect how they feel about the teachers? A: When you have a vibrant curriculum that draws out the children’s enthusiasm, it truly does help cement the relationship between the child and the teacher. The children aren’t afraid of us. They feel perfectly fine about coming up and asking how we are. They treat us with the greatest respect, but there aren’t the usual barriers, because the children feel the teachers’ authenticity, and that what we’re doing here is real. And it helps us be much more effective as teachers and counselors. One little boy misses his dad who has to travel for business and is away a lot. So his teacher trained the child to take a running start and leap into his arms and give him a big hug. It’s in these small vignettes where you can see the relationship between the teachers and students, and the quality of attention the children are receiving.